At Optimum Health Clinic, we take great pride in providing the finest Manual Medicine care to our patients. Below is a sampling of the different chiropractic services we offer in our Prospect Heights office. We provide advanced spinal, muscsuloskeletal, and disc therapy utilizing "state of the art" chiropractic and physical therapy techniques. 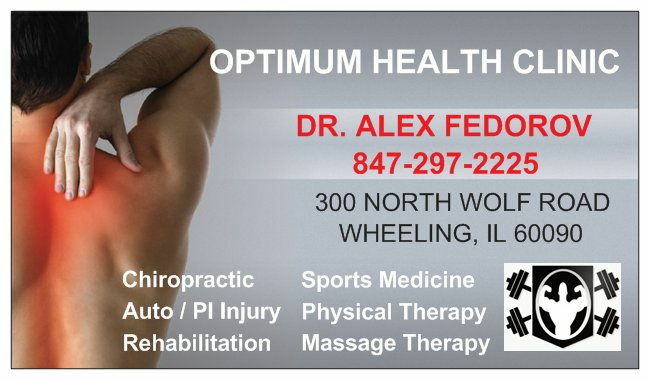 As a Doctor of Chiropractic, Dr. Alex Fedorov has years of training and experience in diversified spinal adjustment, a vast background in physical therapy, rehabilitation and sports medicine. The primary objective is to alleviate pain, restoration of function, strength, endurance and flexibility. We teach our patients specific "blueprint" exercises designed just for them to help strengthen and correct their own unique problem. These exercises can be performed in the comfort of your own home and can improve the effectiveness of your spinal correction by as much as 30-40%. Also, Dr. Fedorov can design a sport specific strength and conditioning training programs for male and female athletes of all ages and levels that will not only improve preformance but decrease probability of injury. After neck trauma the ligaments are stretched, once stretches the structural integrity of the neck decreases and the head moves forward and the curve in the neck (lordosis) decreases or reverses. Over time this anterior head carriage leads to spinal degeneration, arthritis, pain and headaches. However with specific rehabilitation the neck muscles can be strengthened to compensate for the stretched ligament and restore the neck curve thus preventing future neck degeneration. Dr. Fedorov designes each individual weight loss program through behavior and diet modification in addition to exercise. Each patient is given a Food Diery which is filled out, then the baseline caloric intake is determined. Then Dr. Fedorov modifies the existing nutritional intake to have a coloric deficit, in addition to individual exercise program, this ensures safe and perminet weight loss.